Doug Madory, who has been keeping us up to date on traffic (or the or lack of it) on the ALBA-1 submarine cable between Venezuela and Cuba pointed me to a new blog post this morning, in which he reports limited cable traffic. 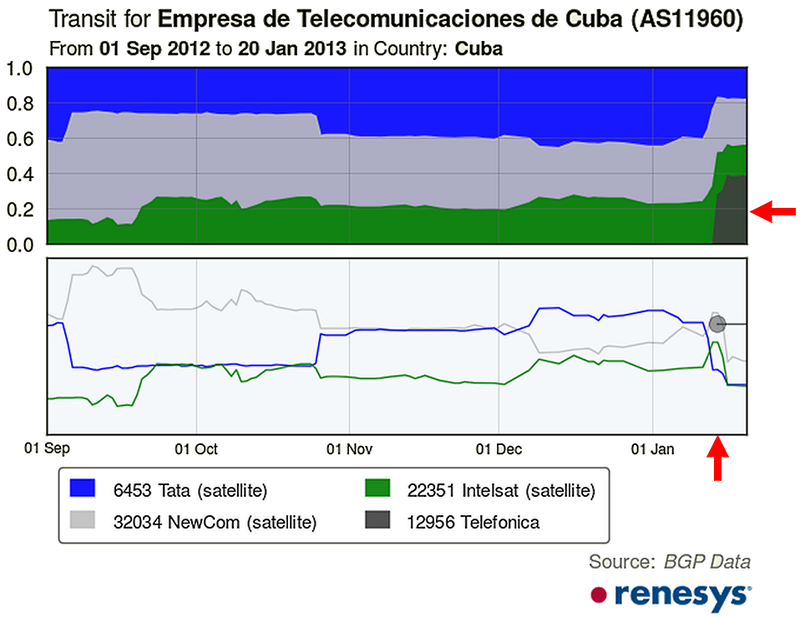 For the past six years, three satellite providers, Tata, NewCom and Intelsat have served Cuba. But, as you see in the above graph (click to enlarge), Telefonica traffic (dark grey) began last week. Telefonica's service to ETECSA is, either by design or misconfiguration, using its new cable asymmetrically (i.e., for traffic in only one direction), similar to the situation we observed in Lebanon in 2011. In such a configuration, ETECSA enjoys greater bandwidth and lower latencies (along the submarine cable) when receiving Internet traffic but continues to use satellite services for sending traffic. He goes on to speculate that the first evidence of ALBA-1 traffic and the elimination of exit visas might be part of a greater trend towards a freer and more open Cuba. My only fear is that the end of the mandate of Hugo Chavez also could represent a step backwards in the advent of the Internet in Cuba. Despite all the skepticism we will all have around these news, they are great news. It is bad news however the secret-ism of the Cuban government, it confuses me why they did not take the opportunity to announce this them-selves. Something smells fishy about it. Thanks Larry for keeping us up to date on this. I understand your skepticism. The seeming one-way connection is a bit fishy too. I hope it is a mis-configuration error and they get the speed up soon. I also hope there is some domestic infrastructure plan to allow them to actually use the cable. Guys, I think this is de Cuban government testing de cable in order to use it for his own interest, not public interest... we should press in some way in the big media here in US to bring the topic UP... If you let me Larry, I can move some pieces down here in Florida and the we can move forward about this... But yes, very interesting your coverage Larry. Thanks! Sure -- spread the word -- that way we might learn more. FWIW, following a traceroute from a Movistar (Telefónica) residential connection in Madrid to Cuba. Sat link seems to be between hops 11 and 13. Before those, everything is *.red.telefonica-wholesale.net. I don't remember so many telefonica-wholesale hops in past tracerouters. Great news, congratulations for Internet users in Cuba. I hope they fix whatever misconfiguration is forcing them to asymmetrically route packets. Any news on whether they also have IPv6 peering on the cable ?